In addition to an indoor pool, Home2 Suites by Hilton Milton Ontario provides a fitness center and a children's pool. The hotel offers a snack bar/deli. Guests can enjoy a complimentary breakfast each morning. Public areas are equipped with complimentary wired Internet access. Business-related amenities consist of a business center and meeting rooms. This business-friendly hotel also offers barbecue grills, multilingual staff, and a picnic area. Onsite self parking is complimentary. A total renovation of this property was completed in 2016. Home2 Suites by Hilton Milton Ontario is a smoke-free property. Situated in Milton, this hotel is 2 mi (3.2 km) from Chudleigh's Farm and 2.3 mi (3.8 km) from Waldie Blacksmith Shop. Glen Eden Ski and Snowboard Centre and Toronto Premium Outlets are also within 6 mi (10 km). Along with an indoor pool, this smoke-free hotel has a fitness center and a snack bar/deli. Free continental breakfast, free wired Internet in public areas, and free self parking are also provided. Additionally, coffee/tea in a common area, a business center, and meeting rooms are onsite. All 100 rooms feature free WiFi and free wired Internet, plus kitchenettes with refrigerators, microwaves, and dishwashers. Guests will also find LCD TVs, free weekday newspapers, and free local calls. Weekly housekeeping is available. Home2 Suites by Hilton Milton Ontario offers 100 air-conditioned accommodations with complimentary weekday newspapers and blackout drapes/curtains. Kitchenettes offer full-sized refrigerators/freezers, microwaves, cookware/dishes/utensils, and dishwashers. Bathrooms include shower/tub combinations. 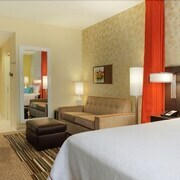 This Milton hotel provides complimentary wired and wireless Internet access. LCD televisions are featured in guestrooms. Housekeeping is provided weekly. A complimentary continental breakfast is served on weekdays between 6 AM and 9:30 AM and on weekends between 7 AM and 10 AM.